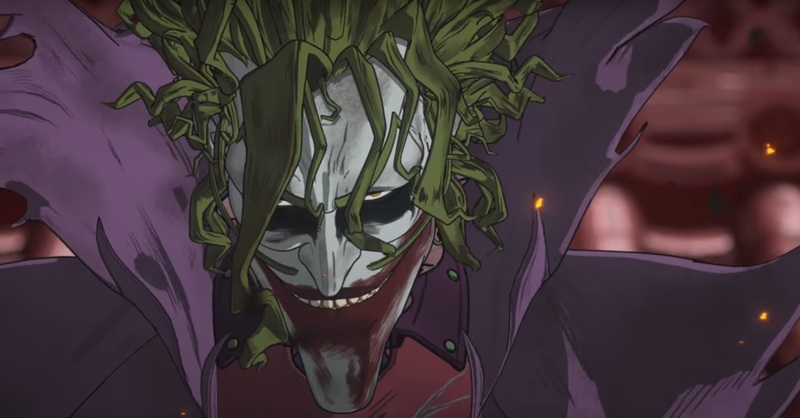 When I first saw the anime trailer for Batman Ninja, I was blown away. It looks gorgeous and the designs for the costumes are fantastic. We’ve had some great looking DC animated Batman movies in the last few years, but there’s no two ways about it: Western animation can’t compete with Japanese animation. Sure, it doesn’t hurt that this latest anime movie has been in the works since 2014. So, the mix of traditional animation and CGI is bound to look impeccably detailed and beautifully rendered. Or that the character designer is the creator of Afro Samurai. Hence, all incredible costumes for Batman, his allies and his rogue’s gallery. On Team-Batman, I spied Catwoman, Alfred, Nightwing, Red Robin and Robin — which means we’re either getting Jason Todd and Tim Drake or Tim Drake and Damian Wayne. For the baddies, there’s Joker, Harley Quinn, Poison Ivy, Two-Face, the Penguin, Gorilla Grodd and I’ll hazard a guess that I spotted Deathstroke. All their costumes looked incredibly elaborate and very creative. I was ready for another Elseworlds tale. And then I did some background research. 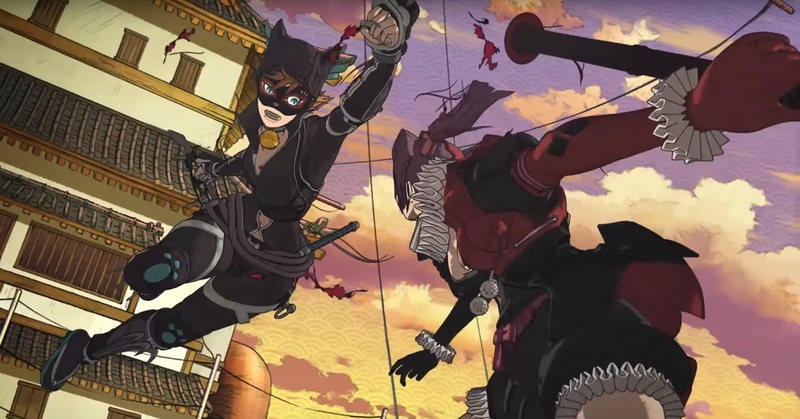 Unlike the recent Gotham By Gaslight, Batman Ninja is not an Elseworlds tale. It doesn’t take place in an alternate timeline or parallel universe. In the beginning of this movie, we start out in the present day, then Joker gets his hands on something and it transports Batman et al. back to feudal Japan. But why? Why tie yourself down to years of lore and history, when you’re just gonna set-up the characters in an entirely different moment in history? Plus, now you’ve added a sub-plot to the run-time of how they got there and if they’re getting back to the future. Far easier to set up shop in the past from the outset of the film. Nothing wrong with that. Some of the most intriguing graphic novels are Elseworlds tales. Aside from Gotham by Gaslight, Batman & Dracula: Red Rain comes to mind. And speaking of “red,” Superman: Red Son is up there and Batman has a pretty great look in that graphic novel, as well. But two of my favorites come from the pages of some single-shot comics that I own. The first is found in the pages of Detective Comics Annual #7 and is called Batman: Leatherwing. It is set on the high seas during the Golden Age of Piracy and sees Bruce Wayne as a privateer for the English Crown. He wears a cape and cowl, concealing his identity to protect his family back home and carries a cutlass. It’s written by one of my favorite DC comics writers, Chuck Dixon, who did a masterful job penning the colorful prose found in the narrative. Batman: Leatherwing encounters all manner of characters. My favorite is Catwoman as a Condesa from Spain, who grew bored of the noble lifestyle and now pirates a ship in her own right. With so many strong historical female pirates (I know I liked Anne Bonny on the TV show Black Sails), she feels right at home in this narrative. Speaking of right at home, the Joker looks perfect clad in outlandish pirate garb. As The Laughing Man, his face is painted white with makeup and he wears a giant green wig beneath his flamboyant hat. It’s a treat to watch him cross blades when he duels Batman on the deck of a pirate galley. The second Elseworlds story I enjoy is found in Catwoman Annual Vol. 2 (OK, I admit it, Catwoman is one of my favorite characters), which finds Catwoman and Batman, among others, in a medieval sword and sorcery world. Catwoman can magically shape-change into a literal cat-woman, while Batman is garbed in a knight’s regalia, complete with sword in scabbard. Never has the term “Dark Knight” been more apropos. 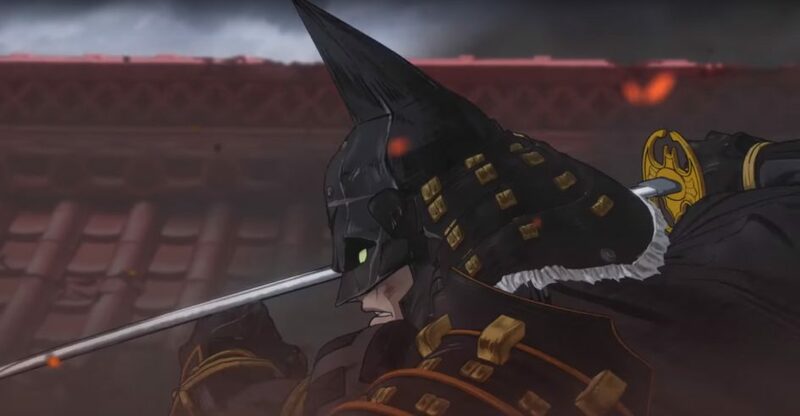 You’ll notice I mentioned swords and crossing blades in both the above tales — and that brings us back to Batman Ninja. 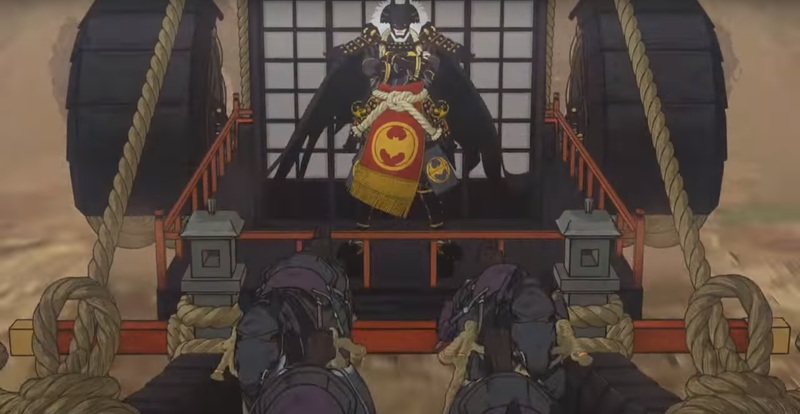 In the trailer, we see Batman wield a samurai sword. While cool looking, it leaves us with a problem: Batman’s no-kill policy. If this was a Batman Elseworlds tale, this Batman could hack through enemies like we were watchin’ Kill Bill and no fan would care. But if this is the Batman from the present day, thrown back in time, then he’s taken a vow not to kill another human being. If he does, well then, we fans will have to hate this director the way we hate Zack Snyder. Which bears the question: What is this director thinking? Why paint yourself into this corner, when you could have set up an alternate universe Batman and no one would care. 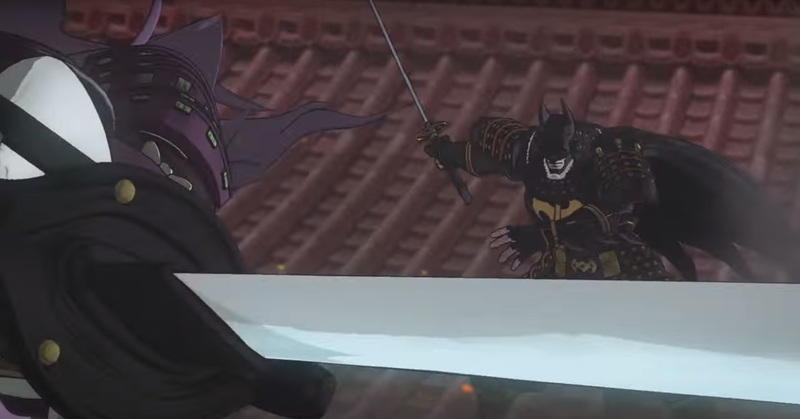 It’ll look just as cool and you could still tell a tale of Batman facing off against the Joker in feudal Japan. You escape the ire of a thousand fanboys and hundreds of harshly worded tweets. Come on man, this is a rookie mistake. And then I looked at the director’s IMBD page. He is a rookie director. He’s got a couple of credits on some Mega Man games under his belt, one segment in the movie, Zoo, and that is it! I started having Josh Trank Fantastic Four flashbacks, where a superhero trailer looks amazing, but we know how the actual movie turned out, because the hotshot young director didn’t have enough experience under his belt yet. Of course, I could be worried over nothing. However, while Warner Bros. is releasing Batman Ninja in theaters in Japan this year, over here, it’s going direct-to-DVD. Call me paranoid, but as cool as this trailer looks visually, I’m not gonna spring full-price for the Blu-ray. I’ll wait til Batman Ninja hits Netflix or else rent it on Amazon. But then again, I’m the cautious type.